Growing Better Lives 2018, a conference exploring and celebrating the links between community growing, care farming, health and wellbeing took place in Manchester in April 2018, sponsored by The Mayfield Partnership. Aimed at community growing and care farming practitioners, health commissioners, policy makers and academics, Growing Better LIves 2018 reflected on the increasingly strong body of evidence about the positive influence of farming and gardening in care and health contexts. Growing Better Lives 2018 also marked the official launch of Social Farms & Gardens, a new organisaiton resulting from the merger of the Federation of City Farms & Community Gardens and Care Farming UK. 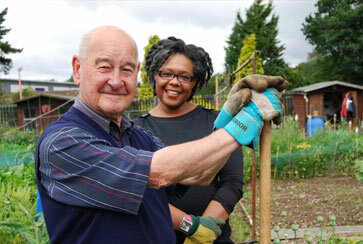 The new organisation was launched by Lord Donald Curry (who has become its new President) and will build on the work of the two former organisations, representing and supporting the delivery of care services and community development through farming and gardening activities. increased awareness and understanding about land-based community growing and care farming activities. celebrated success with their peers through our Local Heroes awards, sponsored by Dobies, highlighting the best of city farms, community gardens and care farming. Much recent research has shown how city farms, community gardens and other community managed green spaces have an vital impact on health, wellbeing, education and sustainable development of community facilities, often in deprived areas. Meanwhile care farming in the UK has grown in prominence in the last decade as an effective form of health and social care - so much so that the expansion of care farming in the UK was mentioned this week in DEFRA’s 25 year environmental plan. An exciting list of speakers included: Dr Rachel Bragg (University of Essex; Dr Mike Hardman (University of Salford); Dr Michelle Howarth (University of Salford); Pam Warhurst (Incredible Edible) and Kathryn Rossiter (Thrive).